Mark Your calendars now! 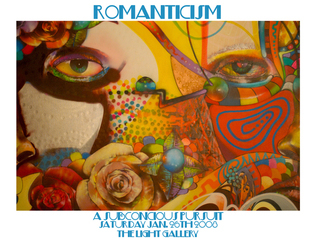 This will be a do not miss exhibition..
ROMANTACISM: A Subconcious Pursuit Jan 26th @LightGallery!! 11-pm-lateAfterparty w/ Dj Mes, Bodyrock Dj’s, Wobs& Nonfiction, & Guests!